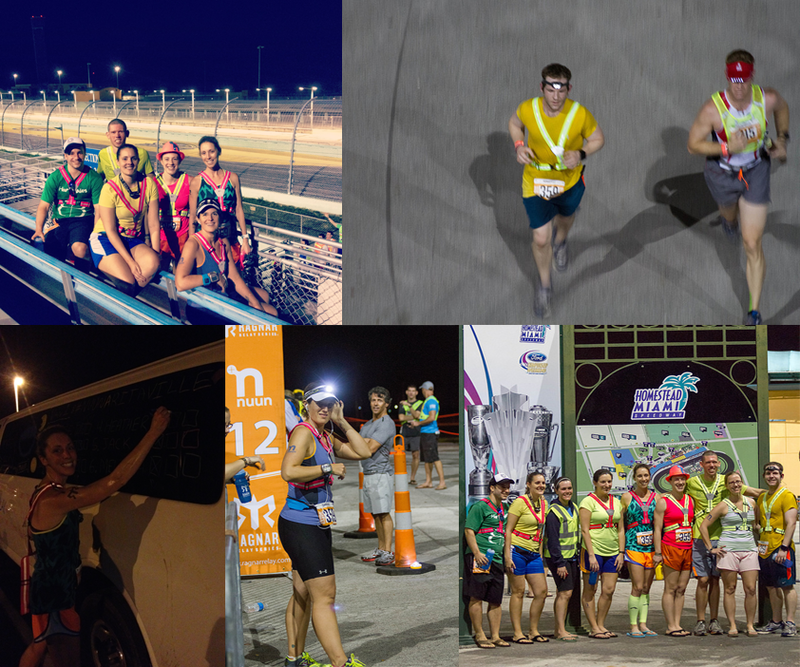 I can’t believe my Ragnar FL Keys experience is already over. I felt like I had been working on planning it and looking forward to it for so long! 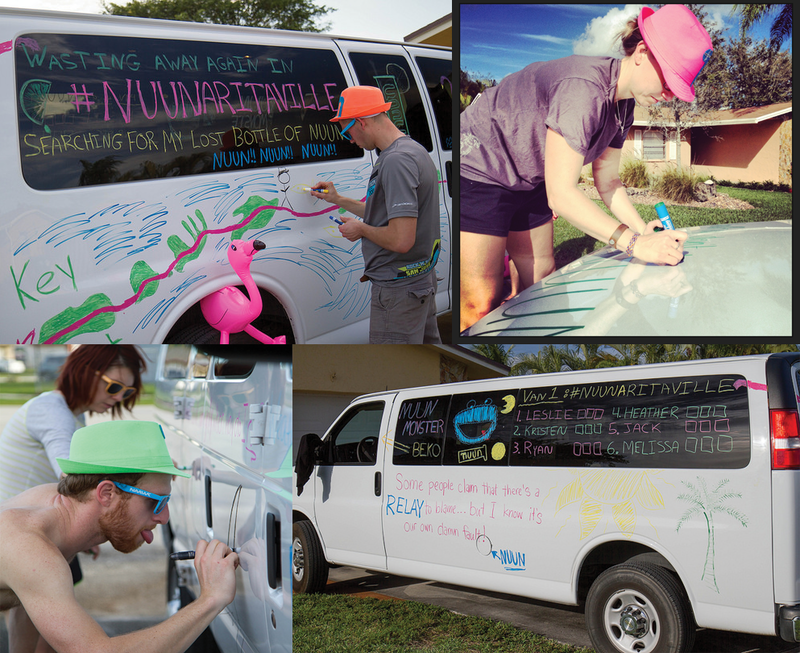 We arrived late Wednesday night so we could have time to decorate the vans and buy van snacks on Thursday — two key components to a good relay. Not everyone had arrived yet, but we weren’t going to have time the next day to get those things done. I think we did a pretty good job! Lots of Jimmy Buffet quotes to go with our theme: NUUNaritaville. Friday morning, our start time was 11:30am. 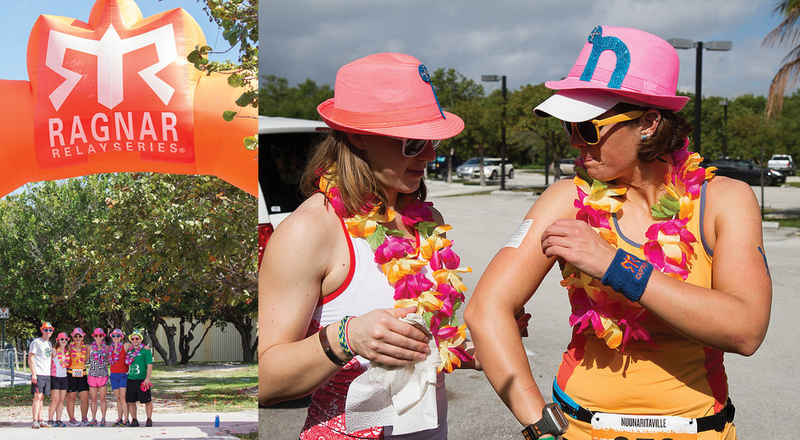 As van 1, we got to the start area early to go through the safety checks, put on our temporary tattoos, and get excited! I spent most of my time in the van as the navigator — luckily I only got us lost once, and we ended up just BARELY making it to the exchange before Jack finished his leg…phew! I wanted to make sure everyone else was having a good time, and didn’t have to worry about where were going. As Leslie mentioned in her recap, we had team members from all over the country, and many people didn’t know each other. Sometimes that can be a little nerve wracking because you don’t know how everyone will get along, but it didn’t seem like we had any isssues. In van 1 we definitely had a great time, and I’m sure van 2 did as well! Onto the running… I was runner #2, which was scheduled for 18 miles. However, two of my legs ended up being longer than scheduled, so I actually ran 19. My first leg started around 12:30pm on Friday — in the heat of the day. Luckily I only had a 4.5 miler on tap. I was so excited to be running and felt really good even though it was hot! This run was through Miami with quite a few traffic lights to deal with. At one point I had to go up on a walkway over the road. I was glad the signs were accurate, because there seemed to be way more turns than I remembered from the maps! I was able to keep my pace up, and even with all the traffic light stops, I averaged 8:44/mi. I was SO thankful when my teammates stopped to give me some water and a power arch boost about 3 miles in. My second leg was at 10:15pm in the dark along a canal path. At the safety meeting, we were told to be careful not to go off the road in this area because of the alligators! Yikes! Nervous in the night!! The road here was dirt and rocks, and made for very difficult running — near the end of the run when my legs were tired, I almost rolled my ankles several times. The good news was this leg was shorter than most of my van mates in the overnight hours, with my mileage being 5.25 miles — average pace of 8:55/mi. It was also cooler overnight so that was a bonus too. Another fun thing about the overnight leg was that it really seemed like we were catching up to the other teams more. With an 11:30am start time we got a later in the day start than many other teams! My last leg was by far the most beautiful, but also the hottest. I started running around 10:30am. My last leg was the longest, scheduled for 9 miles, with most being along the 7 mile bridge. There was no van support allowed on this run, and the only Ragnar water station was at 2 miles due to traffic on the bridge. I was really nervous about this run because I wasn’t sure how my legs were going to be feeling. Plus, the heat was definitely an issue. When Leslie handed off the slap bracelet to me, she said “take it easy, that heat is no joke!” — and she only ran 2.4 miles!! I actually ended up feeling pretty good through mile 6. After that though, I was really feeling the heat and getting tired. With ZERO shade out on the bridge, it was pretty intense. This run also ended up being long, and by the last 0.5 miles, I could not wait to be finished. My vanmates took good care of me after this leg, and let me wait in the shade (of the portopotties, HA!) while they got the van. It definitely took me a while to cool down after that one. I ended up averaging 10:11/mi for the 9.5 miles, which I was very happy with given the heat. I passed a lot of people on this leg because so many others were feeling the heat. After van 1 finished our running, we headed to the finish line after a tasty lunch stop. Van 2 rocked their final legs and Matt brought team Nuunaritaville into the finish line just before sunset on Saturday. We were all so proud of our finish — our final time was 30 hours 43 minutes. Good enough for 89th place out of 478 teams!! 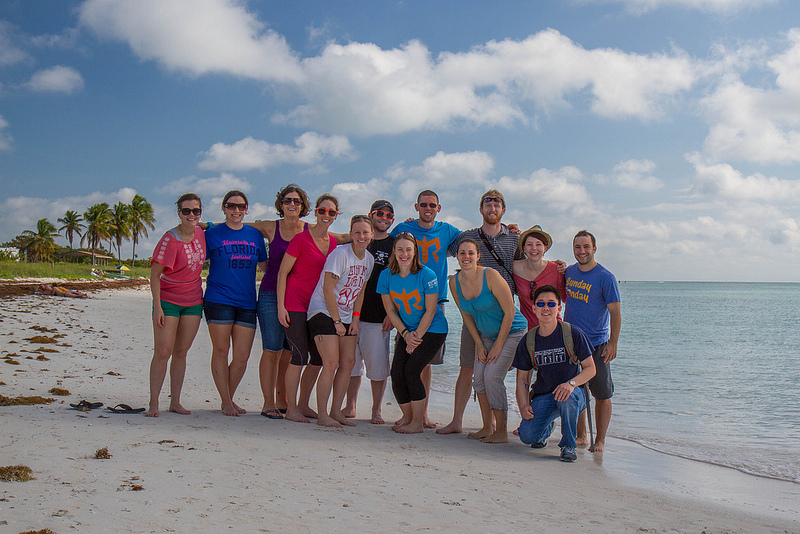 I wish we had planned for an extra day in the Keys following the relay. Next time we do one we will be sure to leave some time for fun afterward. At least we made a quick stop at the beach on our way out of town. This entry was posted in friends, ragnar, recap, relay, running on February 17, 2014 by Kristen L.
Great recap! Thank you so much for navigating most of the time 🙂 I think you and Ryan had the hardest legs, but nailed them all. Good times! Awesome job! Love the re-cap!! I was glad that you and Ryan took the hard legs because they ended up being way harder than I thought!! You killed the bridge…even if you slowed up a bit…you still did great! You couldn’t beat the views either! I had so much fun!! We absolutely have to do another relay one next year!!! I cannot even imagine running in heat so hot it slows me down right now! Crazy. Anyway, looks like an awesome time and so fun! I’ve done two van relays and never knew all my teammates and that makes it much better, I think! Love this, and your pictures are great! I would love to do Florida Keys sometime but I’m a HUGE running in the heat baby so I’m not sure I would be good van company :). Ragnar always looks like such a blast. Your pictures really capture all the spirit and fun! Every time I run a race in FL I swear that I will never run another one in that state. I swear, no matter what time of year, it is always hot and humid. You guys look drenched in some of those photos! You and your teammates looked like you had a blast! This makes me excited for my relay next month! Hahah — yes, it was SO hot!! I absolutely love relays, just great to hang out with friends for so many hours AND do lots of running.